My favorite speaking gigs where the ones where I learned as much from the audience as did they from me, and this one certainly qualified… especially with the 2 days I spent hanging out at this fascinating school. What a creative playground! I was already deep into the Microship project and BEHEMOTH had been off the road for 5 years, but I hauled the bike in the Mothership from Silicon Valley for this talk and enjoyed every minute of of my visit. Engineer and high-tech “nomad” Steven K. Roberts pedaled more than 17,000 miles around the United States on a computerized bicycle. BEHEMOTH (Big Electronic Human-Energized Machine… Only Too Heavy) allowed him to remain network-connected while wandering freely. He now plans to build an aquatic system known as Microship, a folding solar trimaran, which will carry him on an open-ended international journey. 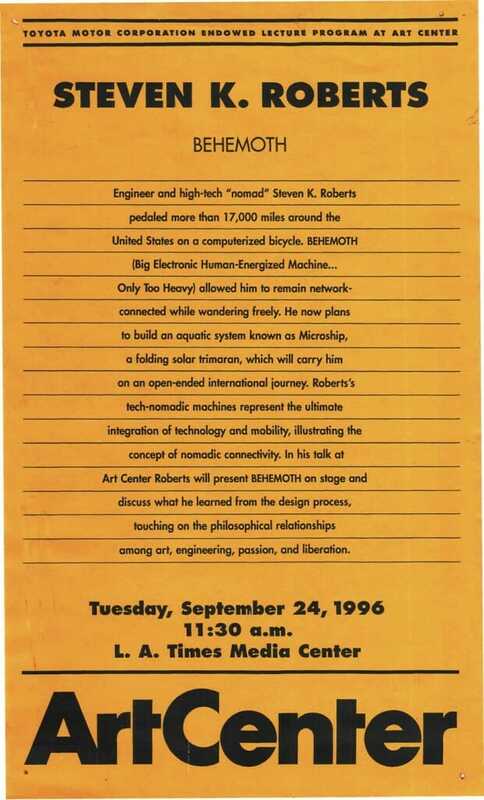 Roberts’ technomadic machines represent the ultimate integration of technology and mobility, illustrating the concept of nomadic connectivity. In his talk at Art Center Roberts will present BEHEMOTH on stage and discuss what he learned from the design process, touching on the philosophical relationships among art, engineering, passion, and liberation.